The kitty says meow when she meets a cow. The cow says moo, how do you do? Learn the names of six animals and their sounds as friendly farm animals say hello to each other on each spread. Featuring sturdy tabs to turn and a die-cut handle built right into the book, this is the perfect story for little ones to read together with parents or flip through on their very own. This new book in the I Love Learning series teaches simple concepts while reminding little ones how much they are cherished through Sandra Magsamen's signature heartfelt text and cozy, hand-stitched illustration style. 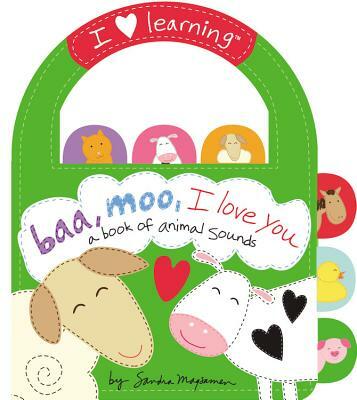 Readers will *love* learning about animal sounds! Sandra Magsamen is an artist, mom, author of Living Artfully, and creator of the Messages From The Heart brand. She designs gifts and ideas that encourage us to live with heart. Sandra Magsamen lives artfully with her family in the Maryland town in which she grew up. You can visit her at her Web site, www.sandramagsamen.com.